10 Questions with Horror Host, Svengoolie! 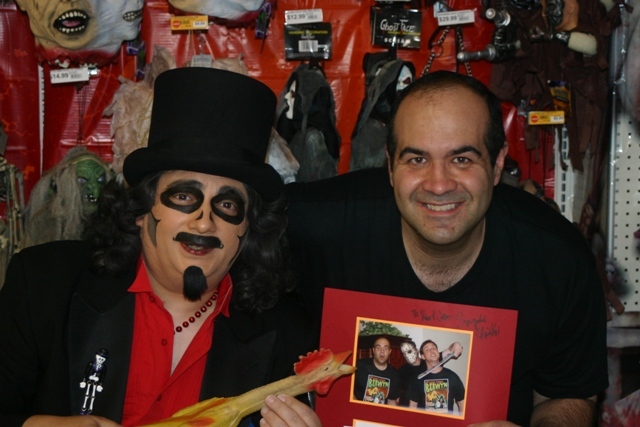 Getting an interview with Chicago’s classic (and modern) horror host, Svengoolie, isn’t easy. Aside from his numerous responsibilities to his station, WCIU, he is also a local celebrity and active in his city. Worse, I had the nerve to make this request amid one of his busiest months of public appearances (last October) that I had seen to date. I was, therefore, surprised when he agreed and answered my questions within a few short weeks. Rather than ask the usual biographical questions I, as a lifelong fan, already knew the answers to, I decided to go a different route. I asked myself, “If I was ever locked in an elevator with Rich Koz for an hour, what would I ask him?” Below are the questions I, as a devoted Svengoolie fan, really wanted to know. For anyone less familiar and interested in some you can check out his site HERE and my memories of Svengoolie HERE. DAVE: The highlight of your show has, for me, always been your parody song. On average, how long does it take you to choose the prefect song and re-write the material to fit your presentation? Can you take us through the process? DAVE: Of all the parodies you’ve performed, which are you the most proud of? DAVE: In a few instances, you’ve taken your parodies a step further and made actual music videos (e.g. “Zombie #5 & “Tomb Digger”). How long does it take to put one of those together and are there any plans to do any more? DAVE: You just completed one of your busiest seasons of Svengoolie public appearances. I’ve been to many of these and am amazed at how diverse your fans are. Is it me, or does it seem like the lines are getting longer? Can you highlight some interesting interactions with your fans? SVENGOOLIE: It does seem the lines have gotten longer! We usually do a two hour signing, and it’s very rare that we don’t have to cut off the line early to make sure that we’ll end on time.The reactions of the fans are amazing to me- they are so sincere, and lately, a lot of them thank me for still doing the show. I hear about how it’s been a bright spot in people’s lives for years, from their childhood on (yes, I AM old! )- how my show is a family viewing tradition- how it has brightened a dark part of someone’s life,or made someone who feels like an outsider feel special. I’ve had interaction with deaf fans, blind fans, people who have gone through or are going through tough physical illnesses, and it’s so touching that they feel like I’m a good friend. DAVE: Your HD presentation of THE BIRDS was a ratings winner and definitely one of the highlights of 2010. Do you have any plans to do any more HD shows in the future? DAVE: If you could gain the rights to show ANY movie which would you choose? SVENGOOLIE: Wow- the wish list would be sooo long- but one I would absolutely LOVE to show is “Fiend Without a Face”- we’ve had so many requests for it, and people have such vivid memories of it- plus, we’d be able to have a lot of fun doing segments to surround it. DAVE: I loved watching the “Night of the Svengoolies” where you and Jerry G. Bishop (the original Svengoolie) shared a stage for Q&A. I know you mentioned that in the early “Son of Svengoolie” days Jerry made an appearance on your show. Was he in costume and have the two Svengoolies ever been seen in costume together? DAVE: Your latest Svengoolie shirt design has out sold previous designs and I love your button collection. Any plans to expand your merchandising including perhaps DVD’s? SVENGOOLIE: I have a meeting in the next two weeks to discuss further merchandising…we’ll have to see what comes of that. We discuss doing a dvd all the time, and have some choices to make before we actually do it. Isn’t doing things legally a pain?! DAVE: Your blog has brightened many a dreary day at work. I am always amazed how you manage to not only post daily but never cease to run out of material to talk about. How do you find the time to do this? Do you plan your entries or do they just come to you? SVENGOOLIE: I never intended to write the blog daily- until one production manager told me that was what they wanted. I write it even if it means staying up past my bedtime to have enough time to do so. I usually don’t do to much planning- it’s whatever hits me, or that I see or hear about. Naturally, when we have a show or event to plug, that becomes a subject. It’s kind of like writing a daily newspaper column- and shows me that, actually, I could do that! It’s really a matter of keeping your mind open to subject matter, and being willing to do research at times. DAVE: You are currently sharing a station with The Mistress of the Dark. I know when I met her in March she clearly admired you. I asked her if she had heard of you prior to 2008 Flashback Weekend and she lit up and asnwered, “Definitely!” Any chance we’ll see you share a stage again with the great Elvira again? SVENGOOLIE: Elvira was absolutely a charmer, and so incredibly nice! I was very flattered that she even knew about me- when we met at Flashback, she – an incredible horror icon- had said, “it’s nice to finally meet you after hearing so much about you”- and I was floored -“YOU heard about ME? !” She was such a good sport to break away from her signing to come up onstage with me. I’d love to do something with her again. I’d love to do some combo promos with her here at the station. She is so cute and funny,and, yes, guys, just plain gorgeous. This entry was posted in Horror Hosts, Stalking Svengoolie! and tagged ELVIRA:MISTRESS OF THE DARK, Svengoolie, Svengoolie Interview. Bookmark the permalink.